Clint Eastwood's brilliant interview of an absent President Obama during the Republican Convention's final night is a singular example of an earthquake happening while the political classes and media pretend not to notice. Of course, they did notice but only to bemoan the performance they completely failed to comprehend. Media, dishonest & low as ever, dilated on the unscripted nature of the performance. Really, it doesn't take much thought to realize had Eastwood been scripted the effectiveness of his address would have been muted to the point of failure. It worked in large measure because every moment while we watched him we knew Clint was making it up as he went. Authenticity is often demanded by the media yet when it is encountered in real time--at a Republican National Convention no less--the whining begins. Make no mistake: the press understood instantly that Eastwood had broken through their filter with a withering criticism of a failed president the media has protected at all costs, including the scraps of whatever integrity they possessed. More distressingly to me, however, were those on my side who didn't get it. The Empty Chair has become a national meme. Twitter is filled with pictures of various empty chairs in an enormous range of settings and locales. The symbolism of an empty chair is perfect for the vapid, badly educated Obama and his disastrous administration. Photos of empty chairs will remain a hilarious leitmotif of this election down through November 6th. Here's a tip to my fellow republicans: if media collectively start screaming bloody murder about something we've done or are doing, carry on. That's the surest sign that we are effective in the moment. And it was just a moment. Some say it knocked Romney off message but there's approximately zero evidence for that. To the contrary, his and Ryan's appearances since the convention concluded have been packed. August represents the third consecutive month Romney has raised 100 million dollars. The selection of Ryan fundamentally changed, to use an Obama phrase, the presidential race. At a minimum we've argued Medicare to a draw, if not slight edge. The enthusiasm gap terrifies the democrats, as well it should. Media know it and consequently will never write about it. I've gotten a sense that a lot of people are changing their minds since last Thursday night. Eastwood gave something unlike anything anyone had ever seen before at a national political convention. But by today there's not much excuse for seeing this performance piece as anything but brilliant. Do yourself a favor and watch it again. Click here. Old CW: Eastwood a disaster. New CW: Eastwood brilliant, but Romney incompetent because his advisers fell for previous CW that Eastwood a disaster. Too many republicans, and not just Romney advisors, fell for that media generated conventional wisdom. Do you think Andrew Breitbart would have? Well do you, punk? "The fact that Obama and his campaign team are now saying nice things about Clint Eastwood tells me Clint is very popular with independents." That's pretty much the game, isn't it? 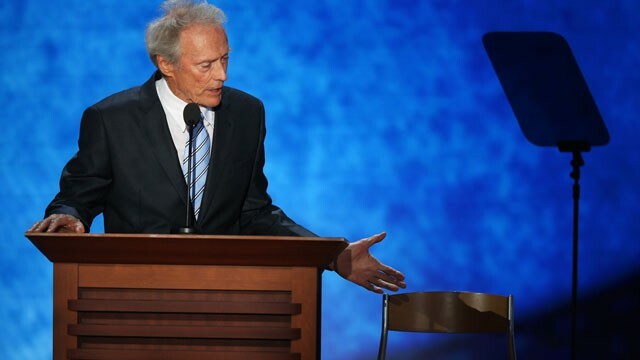 Let's hope republicans can be as smart as Team Obama, enjoy the laugh Eastwood provided, smile at the new verb "Eastwooding" and suppress laughter at the discomfort it brought the media. Phew, how much more can one 82 year old man do in a 12 minute speech? Clint Eastwood was indeed brilliant. It's "empty chair day" on Facebook with many hilarious pictures. My favorite was an empty suit in an empty chair! Loved your empty chair pics at the Gov. mansion and street intersections. Please post them here!